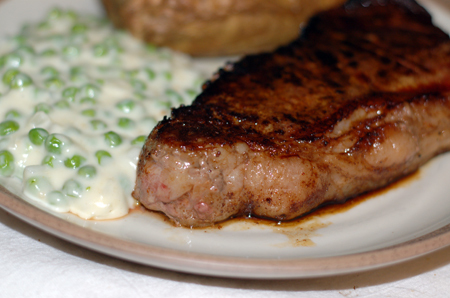 We hardly ever eat steak; it’s one of those foods that we reserve for special occasions. Consequently, when we do get steaks, I usually end up scratching my head when it comes time to cook it. We don’t own a grill, and our tabletop electric model is sketchy at best, since it only has one heat setting—plugged in. For the most part, I have been sticking with a trusty cast iron skillet in cases like this, and I’ve been very pleased with the results; just know that if you like your steak on the well side of medium, you will probably want to stick them in a hot oven for a few minutes after searing them, to avoid burning the outsides to a crisp. This time around we had New York strip steaks rubbed with a mixture of espresso powder, chile powder and a few other choice ingredients. Don’t ask me how, in our coffee-averse family, I went this direction, but the earthy flavor of the espresso worked really nicely in combination with the warm chile powders and sweetness of the brown sugar, in almost a barbecue-adjacent way. I seasoned the steaks when they came out of the refrigerator and allowed them to come up to room temperature before cooking them. The recipe below makes enough rub to keep for a while; I cut it in half and still ended up with enough for two steak dinners. Mix all up and store in an airtight container. Makes about 1 1/2 cups.